“Productivism or growthism is the belief that measurable economic productivity and growth are the purpose of human organization (e.g., work), and that ‘more production is necessarily good'”. Some media outlets will directly reprint special interest group “content” under their own masthead. The Detroit Free Press has directly published materials prepared by a branding firm called “Issue Media Group,” which is dedicated to “creating new narratives” that promote growth and investment (Issue Media Group, 2014). Alternet, Salon.com and Alternet, Salon.com and Truthout have published material written by “Global Possibilities,” a special interest group funded in part by the oil company BP and a group of automotive and energy industrialists represented through The Energy Foundation (Global Possibilities, 2013).Truthout have published material written by “Global Possibilities,” a special interest group funded in part by the oil company BP and a group of automotive and energy industrialists represented through The Energy Foundation (Global Possibilities, 2013). The special interest group “Inside Climate News,” funded in part through The Energy Foundation, the Rockefellers and other productivist interests, claims to publish through numerous media brands including the Associated Press, Bloomberg, Business Week, The Weather Channel, The Guardian and the McClatchy Group, a conglomerate of 30 daily newspapers across the USA (Inside Climate News, 2014). 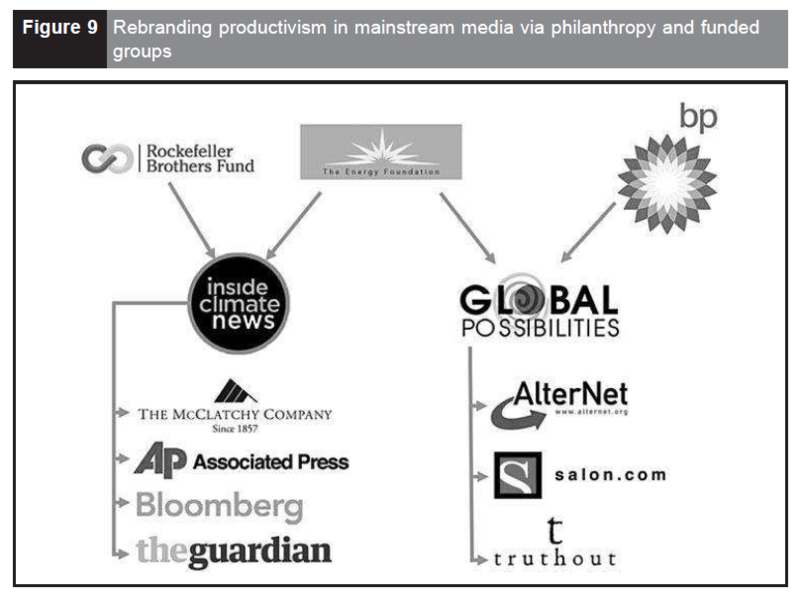 Special interest groups commission their articles from within a sphere of private, typically business, interest. Readers and viewers have a difficult time distinguishing between such sponsored content and traditional independent journalism Figure 9. Set against the backdrop of a clear blue sky, alternative energy technologies shimmer with hope for a cleaner, better future. Alternative energy technologies appear to be generating a small, yet enticing, impact on our energy system, making it easier for us to envision solar-powered transporters flying around gleaming spires of the future metropolis. Understandably, we like that. These visions are certainly more pleasant than imagining food shortages, land decimation, economic disintegration and conflict, which we might otherwise associate with fossil fuel scarcity. The immediate problem, it seems, is not that we will run out of fossil fuel sources any time soon, but that the places we tap for these resources – tar sands, deep sea beds and wildlife preserves – will constitute a much dirtier, more risky and far more expensive portfolio of fossil fuel choices in the future. Certainly alternative energy technologies seem an alluring solution to this challenge. And while this is a pristine and alluring vision, might it also be a deadly distraction? Debord (1970, p. 14) wrote that “the society which rests on modern industry is not accidentally or superficially spectacular, it is fundamentally spectaclist.” Perhaps he could have spoken similarly about modern energy or modern environmentalism. Debord’s spectacle is a divine deity around which duty-bound citizens gravitate to chant objectives without reflecting upon fundamental goals. Debord’s spectacle is a divine deity around which duty-bound citizens gravitate to chant objectives without reflecting upon fundamental goals. It’s all too easy for us to miss the limitations of alternative energy, Debord might say, as we drop to our knees at the foot of the clean energy spectacle, gasping in rapture.It’s all too easy for us to miss the limitations of alternative energy, Debord might say, as we drop to our knees at the foot of the clean energy spectacle, gasping in rapture. This oracle delivers a ready-made creed of ideals and objectives that are convenient to recite and that bear the authority of science. These handy notions of clean energy reflexively work into environmental discourse. And as we have seen here, productivist environmentalists enroll media to tattoo wind, solar and biofuels into the subcutaneous flesh of the environmental movement. In fact, these novelties come to define what it means to be an environmentalist. And environmentalist’s aren’t the only ones lining up for ink. Every news article, congressional committee hearing, textbook entry and bumper sticker creates an occasion for the visibility of solar cells, wind power and other productivist technologies. Numerous actors draw upon these moments of visibility to articulate paths these technologies ought to follow. First, diverse groups draw upon flexible clean-energy definitions to attract support. Then they roughly sculpt energy options into more appealing promises – not through experimentation, but by planning, rehearsing and staging media demonstrations. Next, lobbyists, foundations and PR teams transfer the promises into compelling stories, legislative frameworks and eventually necessities for engineers to pursue. What happens to our analyses of “innovation” if we frame “innovators” as skilled, or perhaps unwitting, “conjurers” of an illusion of abundance? A consequence of alternative energy visibility-making appears to be the necessary invisibility of other options. There’s only so much room on the stage. Energy reduction strategies, degrowth, economic contraction and other decline pathways remind people of their reliance on finite resources, or their own vulnerability to the imminent contraction. In ominous times, might individuals invest their enthusiasm into alternative energy narratives, thereby allowing themselves to cognitively avoid existential threats and circumvent otherwise undesirable reckonings? Perhaps we have forged magnificent energy spectacles only to cast ourselves as climatic superheroes within the late stages of an illusion of abundance. If so, then these spectacles have come to protect us from questions about our own culpability in ecosystem decline. Green technologies bypass worries of raw material scarcity, as they exist in our minds apart from fossil fuel and extractive industry. They ease our anxieties about increasing levels of CO2 so long as we faithfully believe that they are carbon-free undertakings. But most centrally, alternative energy spectacles protect us from considering our own growth, in consumption and population, which could not otherwise come to a peaceful end within the logic of the current expansionist milieu.